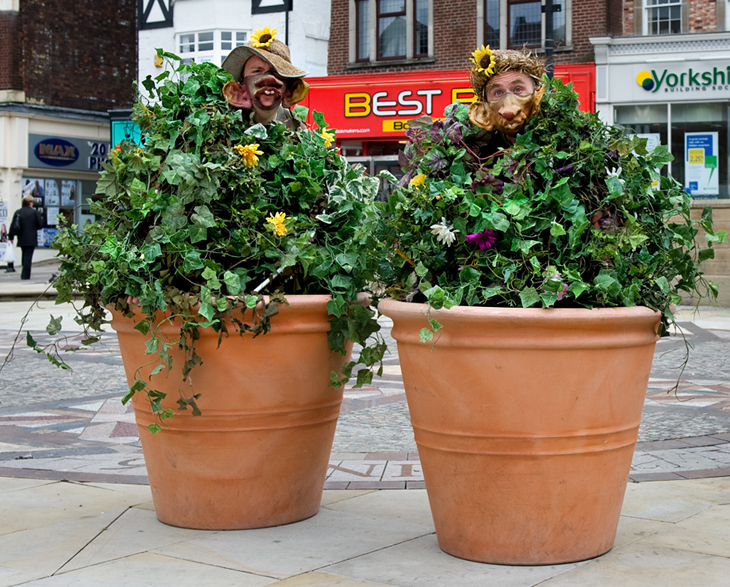 There are some real Plant Pots in Wigan! plot te plot te plot weeeeed. Just what we need to cheer us all up! Thankyou. A good and humerous photograph - I liked it a lot!!! They did this on the day Wigan was judged for its entry into North West in Bloom. Shows we have a good sense of humour. Good fun. Glad to see that people still have a sense of humour......thanks to the guys and to Dave....for seeing the fun in it. Is that your hat Dave? Good photo I like it. And you were taking some nice photos in Shevington on Tuesday Dave - hope you enjoyed the cup of coffee. Just seen the photos you took of Shevington - they brought a smile to my face - I would love to put some captions to them. Lovely meeting you too. Keep taking good photos for us.